Used to be, homework was done – well – at home. These days, some Long Beach kids do homework anyplace but home. Cabrillo High School sophomore Angel Mijares, for example, heads to a friend’s house after school. That’s because the friend’s family has broadband; his doesn’t. Other kids head to the nearest city library. “It’s not my cup of tea,” Angel said. But, for some, it is. Geovanni Martinez, a Long Beach Poly High sophomore, drops by the Mark Twain Library. Usually on Tuesdays and Thursdays when it’s open till 7 p.m. Geovanni said he waits in line to get on a computer 15 minutes, sometimes longer. Poly High freshman Oshelyn Copeland hops on a computer at school. “I usually stay after school so I can get the internet portion of my homework done,” she said. Oshelyn said homework typically takes three hours on a weekday. Two of those entail going online. Such stories hardly come as a surprise to Gladys Palpallatoc, associate vice president at California Emerging Technology Fund, a group with offices in Los Angeles and San Francisco that is pushing for more affordable broadband. “Homework is assigned online. Research is done online. Testing is done online,” Palpallatoc said. So students must get online or risk being left behind, she said. Vanitha Chandrasekhar, educational technology coordinator for the Long Beach Unified School District, said educators have fully integrated the internet into the school experience. In recent years, the 74,000-student district has purchased 11,000 iPads and 58,000 laptop-like Chromebooks for use in the classroom, Chandrasekhar said. The district recently began rolling out digital textbooks, although students can still opt for traditional textbooks. And Wi-Fi is piped into all instruction areas. 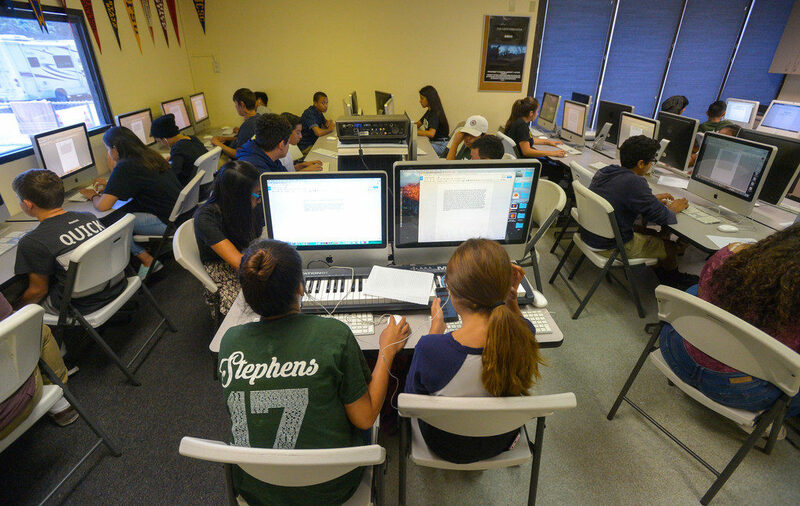 In Long Beach, teachers issue homework assignments, and kids look for those assignments, online. And students turn in assignments online. Teachers use a web-based program to post scores and communicate with their students, Chandrasekhar said. “Parents have access to it, so at any time they can check and see the child’s grades,” she added, noting that there are fewer surprises on report-card day than there were in the past. There’s a problem, however: Not every student, or parent for that matter, has internet access and can use that program. LBUSD spokesman Chris Eftychiou said the district has a good idea how many students lack access. Educators, he said, recently surveyed students and found that 83 percent of pupils in grades 4 and 5, and 90 percent in grades 6 through 12, have the ability to connect to the internet at home. Those numbers track reasonably close to the U.S. Census Bureau’s 2016 American Community Survey, which found 86 percent of Long Beach residents under 18 live in households with internet access. Experts say those numbers don’t tell the whole story. Some students have access at home only because they have, or someone in the family has, a smartphone. The Census Bureau considers a person with a phone and data plan to be someone who has an internet subscription. In one sense, the smartphone has helped bridge the divide. It has put the web within reach of people who formerly could not get online. 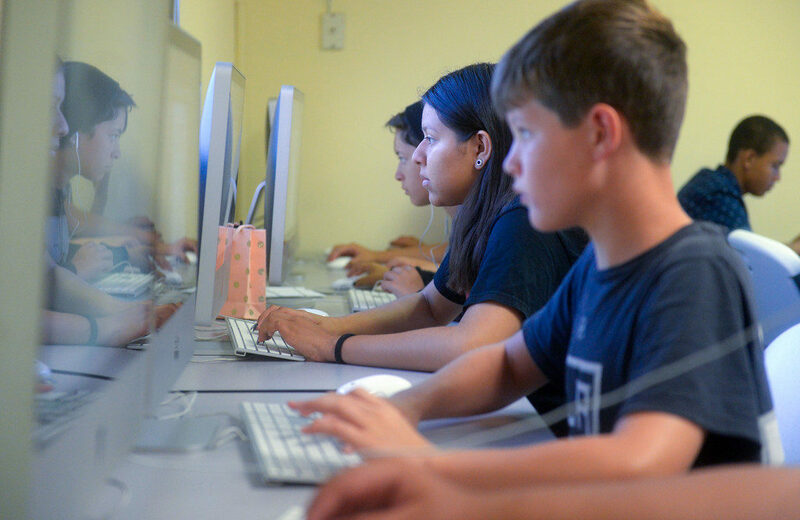 Gwen Shaffer, a Cal State Long Beach journalism professor who specializes in broadband access, said the smartphone is far from ideal, however, for kids going to school. Doing homework on a tiny touchscreen, Shaffer said, is much harder than completing an assignment on a large-screen laptop or personal computer with a keyboard. “There are plenty of Long Beach Unified students who attempt it because they have no choice,” she said. Angel, the Cabrillo High sophomore, is one who has. Angel said he wrote a report last spring about the classic book “Lord of the Flies” on his smartphone. He didn’t. He persevered. But Angel vowed to never do another report on his phone. Chandrasekhar, the technology coordinator, said teachers realize students face daunting challenges. “They try to provide time in class to do most of the digital work that needs to be done on the devices,” she said. Chandrasekhar said some schools open libraries after hours so kids can do internet-based homework. 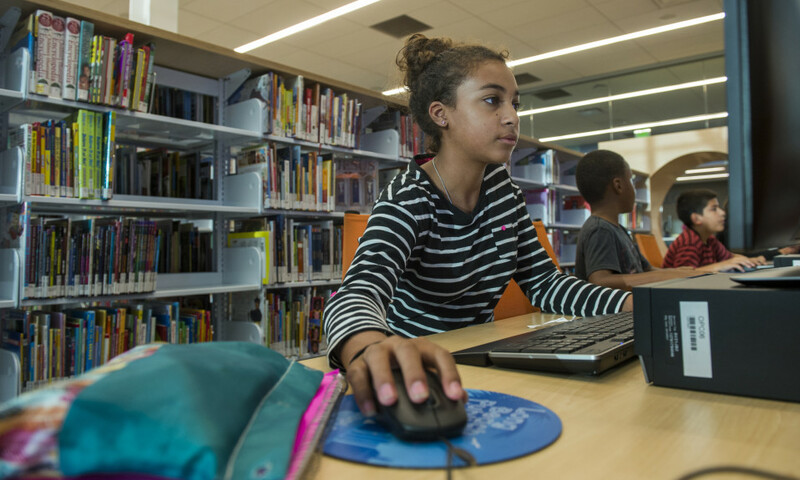 They also coordinate with city libraries and community organizations such as the YMCA that provide banks of computers for the public. And flexibility is built into the curriculum. Flexibility and options help. But it would be better, experts say, if kids could do homework at home. Maria Alvarado reached that conclusion a few years ago. 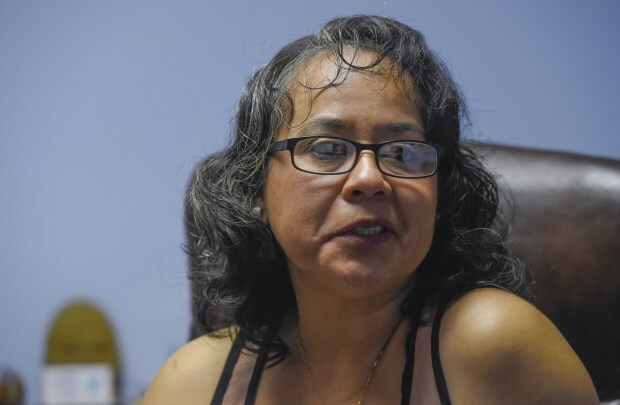 Alvarado, 45, said in Spanish through an interpreter that she had been dragging her feet about getting a computer and signing up for broadband. “It was expensive,” she said. Then Alvarado ordered broadband anyway when her children were in middle school. “My kids convinced me that it was necessary,” she said. Oshelyn Copeland and twin sister, Oliviyah, said home broadband would make a huge difference. “I think it would be easier to do (homework) in the comfort of your own home,” she said.